Though the sun later broke through, the early morning was cloudy and cold when I walked through the garden looking for blooms. Forecasts warn of lows near freezing tonight and temperatures will dip into the twenties later this week. But here it is, March 20, 2013, and today is the first day of spring. 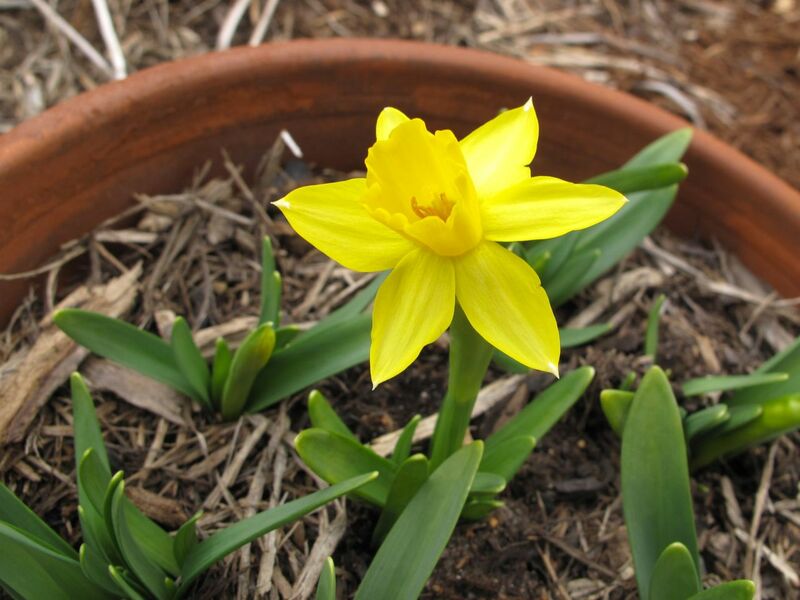 The vernal equinox occurred at 7:02 a.m. EDT. 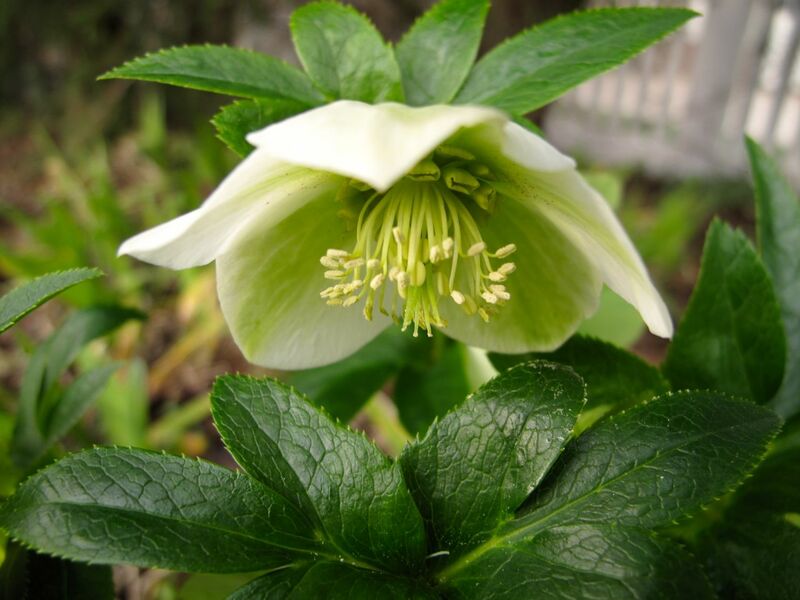 The early blooms of Helleborus have been a highlight since the first week of January. The garden is waking up but shows no sign of hurry. 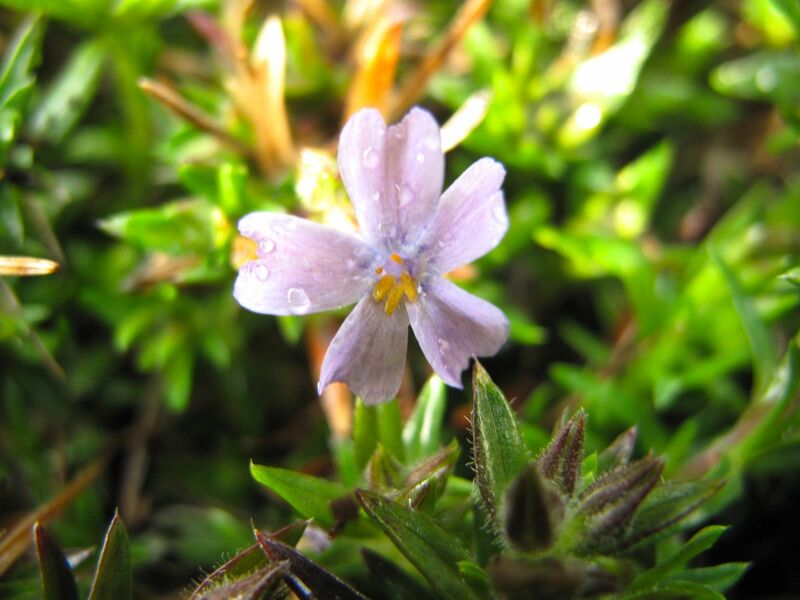 Among the several patches of Phlox subulata a lone flower is open. 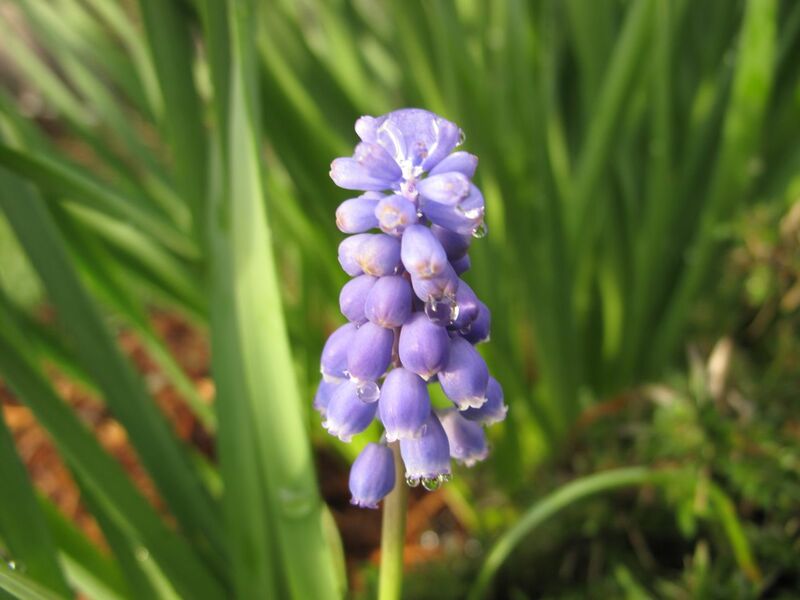 A few little Muscari flowers began blooming this week. These were planted over a decade ago and barely bloomed at all last year, so it is nice to see them again. 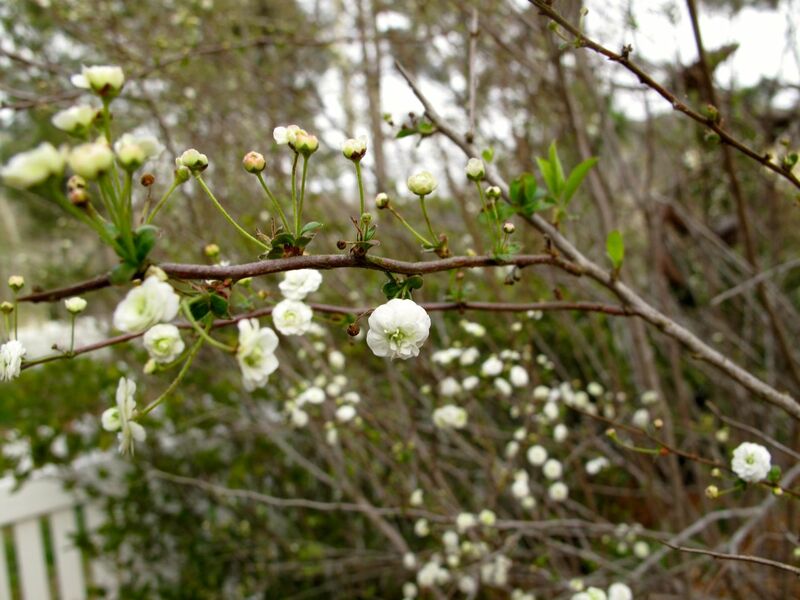 Diminutive white flowers are beginning to fill the branches of a Spiraea I brought from my previous garden. 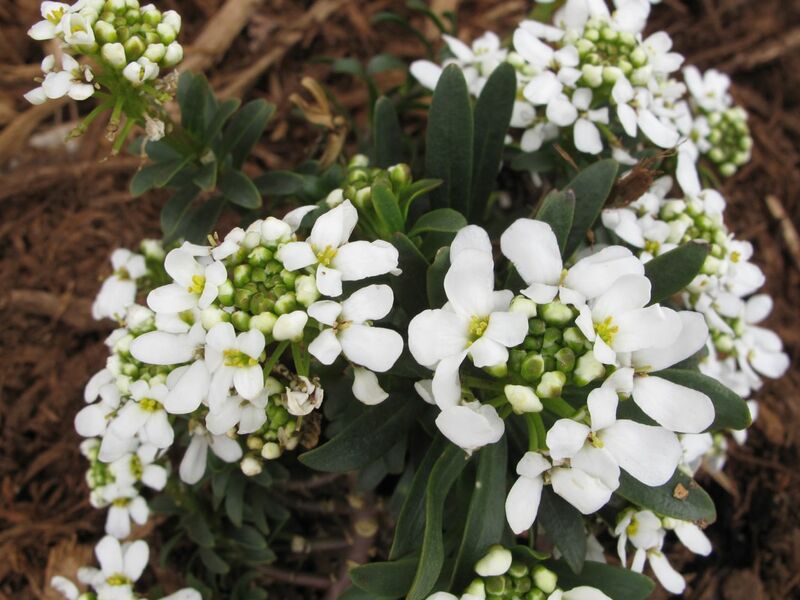 Iberis Sempervirens filled the meditation circle last year but most of what was planted there has died out. I blamed moles but also realize the site may not drain well enough for this plant. Fortunately it is tucked around the garden in other spots, a cheery little plant. Last fall I finally remembered to add a few more daffodils to the garden. Just opened today is the first flower of the miniature Narcissus ‘Tete-a-Tete.’ The garden was so overgrown when it was time to plant these bulbs, it was hard to find a good place for them. They were relegated to an old terra cotta pot, which worked out just fine. 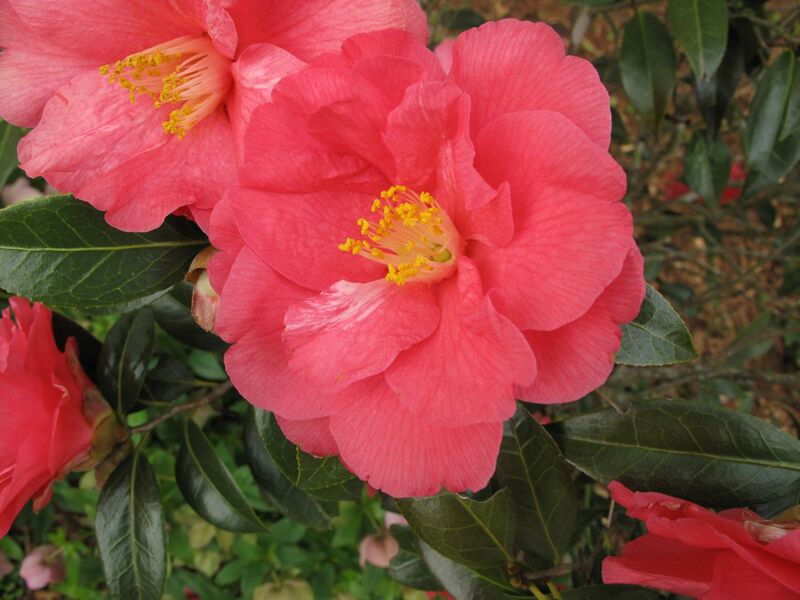 Camellia x ‘Coral Delight’ has been blooming beautifully for a few weeks. I love the milky white streak that marks these blossoms. 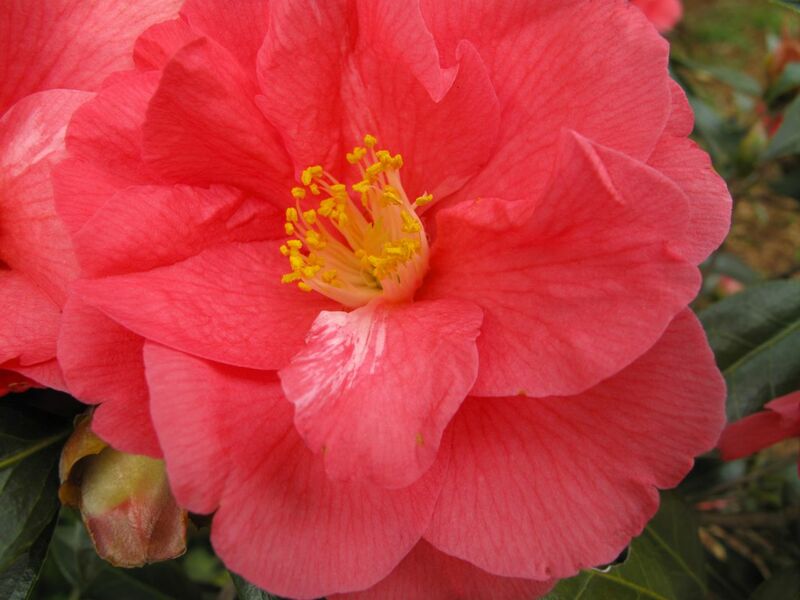 This entry was posted in garden and tagged Camellia 'Coral Delight', early spring plants, Hellebores, iberis sempervirens, muscari, phlox subulata, Spiraea, spring, Tete-a-Tete, vernal equinox on March 20, 2013 by pbmgarden. Happy Spring from the frozen tundra with 8 inches of snow and cold…more snow on the way…yipppeee!!! Not really…love your blooms as mine are gone again. Donna, wish I could send you a touch of spring. Hold on though, it will make its way to your door soon. I know someone in Detroit who after a particularly tiresome, snowy winter, took his small children outside with spay bottles filled with vegetable food colorings. They had fun drawing their own flowers in the snow. Your spring photos are wonderful. I have been taking walks every day to see spring arrive this year and have found it to be amazing, I see that in your photos. Thanks Charlie! It’s so interesting to check on spring flowers daily. Sometimes I might find a wonderful bloom that the day before I would not have predicted possible. Spring is slower this year but I’m enjoying the pace. Yes, it’s nice to have a few flowers. Happy Spring Christina! So glad that spring has finally arrived for you, your flowers are really beautiful, so full of spring’s promise. I just wish our weather would warm up a bit and that the rain would stop! Hope you get some nice, warm and sunny days soon Pauline. Happy Spring!